For our first member of the month, we drew the name Soldan, and not know which sister it was, we decided to spotlight both of them. You have undoubtedly seen them around, mainly coming to the 4 and 5 pm classes and staying for extra work on pull ups and lifting. We wanted to get to know a little bit more about the silent fury that is Chelsea and Mackenzie. 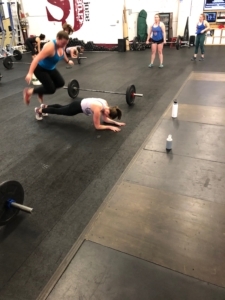 [MS] For exercise, I wasn’t really doing anything when I started CrossFit. I’ve done some yoga in the past, and run with my dog–more consistently at some points than others. Growing up, I mostly danced at a studio. I also did some sports in rec leagues (soccer, swimming, basketball). [CS] Before CFSJ I was in college and the people I met there were my community and we had some fun times. As for exercise, there wasn’t much of it in college but I was lucky enough to go to school where I could go for runs on the beach from time to time. I also played soccer until I finished high school. 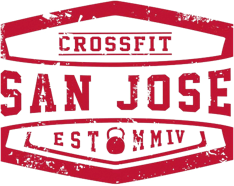 [CFSJ] What brought you to CrossFit? 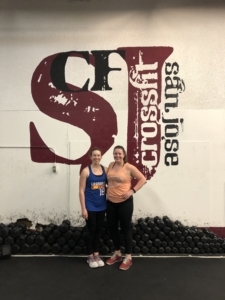 [CS] My sister (MacKenzie) brought me to CrossFit! It’s all her fault! [MS] I watched a 20/20 one night, and one of their segments was interviewing Greg Glassman. I hadn’t really heard of CrossFit before this. They showed people doing all these really difficult-looking movements, and I more or less thought, “I’d like to be able to do those things.” I was also not doing anything fitness-related at the time, this seemed like something I could start doing, and keep doing, and gradually get closer to being able to do those things. [CFSJ] What are your goals? [MK] In the long term, basically I want to be able to do more of the skills, and do what I can do right now better. In the short-term, I want to get my pullup back, and then maybe focus on getting toes to bar and increasing the number of pullups I can do. [CS] This year I’d love to get a strict pull up and freestanding handstand. [CFSJ] What’s the thing in CF you’re most proud of to date? [CS] There’s a lot! But I’ll say I’m pretty proud that it didn’t take forever to get those pesky DU’s. [MK] I feel proud when I can do something a little better than I could before, whether it’s because of strength or technique (or usually a combination of the two). [CFSJ] What keeps you coming back? [MK] Mostly the people here, the sense of community. Also I enjoy the challenge in the workouts, and the variety of movements. [CS] The people! It’s fun to lift heavy things and all that but I could do that at any other gym- but I definitely wasn’t. It’s wonderful to feel like a part of the community and to have other members and coaches know what you’re working on and cheering you on.